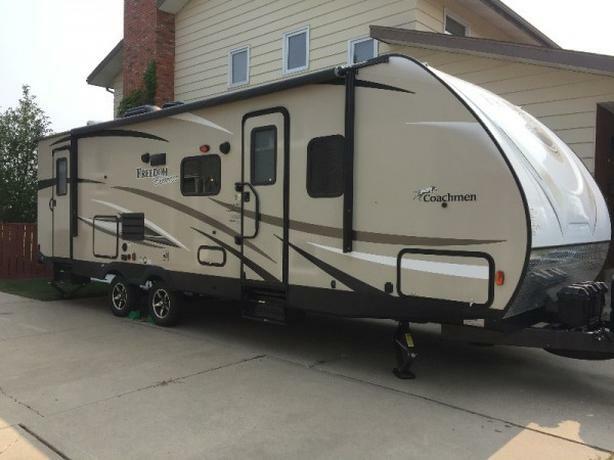 2017 Coachmen Freedom Express 282BHDS Trailer. We bought this trailer new in 2017 and used it only a handful of times but must sell. It is a great trailer and is in immaculate, essentially new condition. Paid 35K plus the hitch, batteries, extras and GST. Almost 40K when all was said and done. Ultra-light at 5906 lbs empty - easy for a ½ ton to tow. Too much to list but comes with almost everything you need to go camping. Sleeps 8. Double wide bunks (50X74). Queen bed in master. Power awing. Folding resin table. LED TV and DVD/Radio unit. Cable port. Two exterior access doors. Solar port. Indoor/outdoor speakers. Air conditioning/furnace. Outside shower. Outside BBQ. Outside Fridge and food preparation space. Two outdoor mats. Outside lights. 2- 6-volt batteries. EQ hitch (hitch and stabilizer bars). Hitch weight 736lbs. Gross weight 7700 lbs. Dry weight 5906 lbs. Cargo weight 1794. Fresh water 49 gallons. Grey water 33 gallons. Black water 33 gallons. Extension cord with adapter. Extra fuses. Large Slide-out. Please call 403-892-6777 to view.